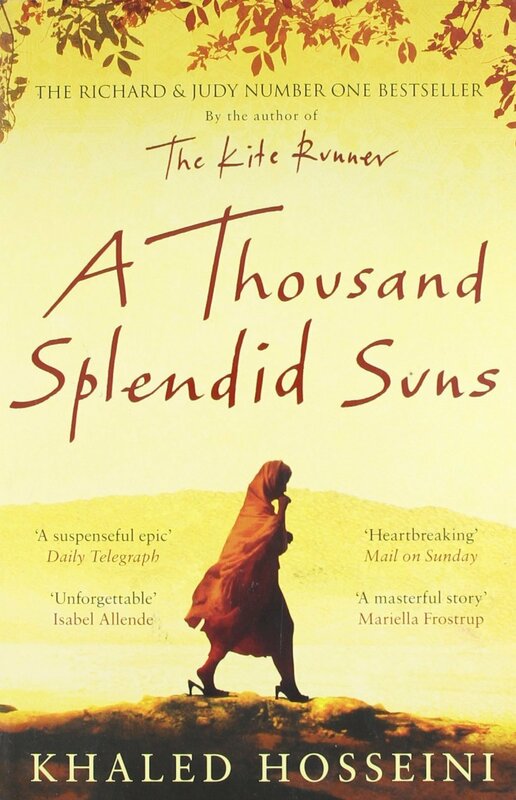 ‘A Thousand Splendid Suns’ was published in 2007 by Afghan-American novelist Khaled Hosseini. If you haven’t heard of this book, you might be familiar with his first novel, ‘The Kite Runner’, a best seller back in 2000. I never read The Kite Runner, and only happened upon A Thousand Splendid Suns because a friend recommended it to me, and after reading it, I’m finding it slightly difficult not to run out and buy The Kite Runner right now, if it is anywhere near as beautiful as A Thousand Splendid Suns I know it will be money well spent. The novel is written in three parts, and follows the life of two Afghani women, Mariam, the illegitimate daughter of a wealthy Herati gentleman, and Laila, 19 years Miriam’s junior, born 500 miles from Herat in the city of Kabul, into a humble, but loving family. Hosseini follows the two women, tracing a story in which these two very distinct characters, who have had such different starts in life, find their lives intertwined, and discover in one another an unlikely and beautiful companion. Hosseini begins with Mariam, a young girl growing up in the 1960s on the outskirts of Herat, a small city in Afghanistan. Mariam resides with her mother, Nana, a spiteful, epileptic woman, who was once employed as a servant in the house of her father, Jalil. Hosseini writes of how Mariam dotes on her father, living for the time once a week when he will visit her, his only illegitimate child. However, Mariam soon discovers the shame that she brings upon her father, and at the age of just 16, she is forced into marrying Rasheed, a 45 year old a widower, far away in the city of Kabul. As someone very far removed from the lives of women like Mariam it was incredibly moving to read Mariam’s thoughts when she realised that her father, the man she had been so infatuated with, was ashamed of her, that his whole family was ashamed of her. The devastating discovery that “she was being sent away because she was the walking, breathing embodiment of their shame”. The injustice of Mariam’s situation made me feel so angry, I wanted desperately to have her turn around and refuse to leave, to refuse the future they had condemned her to. But of course a woman such as Mariam has no choice in these matters. At first, the life which Mariam is introduced to doesn’t seem too terrible. Rasheed treats her well, and buys her gifts. Mariam recounts with pride the secret married glances they exchange out in the streets, and even feels flattered by Rasheed’s insistence that she wears a burkha. Unfortunately for Mariam this innocent happiness is short lived, and when Rasheed discovers that Mariam cannot fulfil a wife’s duties he begins to abuse her both physically and verbally. In the second part of the book Hosseini introduces the reader to a very different family, in a house down the street from Rasheed and Mariam. Laila is the only daughter of a loving family, born into a secure home, full of hope and love. However, the beginning of the Afghani war against the soviets puts a swift end to Laila’s innocent childhood, and when both her older brothers leave to join the fight, Laila learns that her future is no match for her brothers’ past. Intelligent, beautiful and ambitious, Laila is different from the other girls her age; she seems to have greater things in stock for her than an arranged marriage and the life of a housewife. Therefore it comes as somewhat of a shock when Laila suddenly finds herself without her family, and faced with the prospect of lasting out on the streets on her own. This leads her to make the devastating decision to become Rasheed’s second wife. These women ultimately realise that they need something to hold onto, and that their only one hope of finding any warmth and solidarity, was in the arms of one another. While Mariam and Laila cannot escape from the cruelty and injustice which surround their lives, they cope with their situation by finding hope in one another, supporting each other like pair of crutches. The injustice faced by the women is astounding, and as laws forbid Afghani women from running away, there is little hope for the women; even the authorities routinely turn a blind eye to violence at the hands of a husband, because “What goes on in man’s house is his own business”. Again, read through the eyes of a very different world, it is almost inconceivable to imagine what goes on in the life of these women. And more than anything remarkable and beautiful that in spite of everything, Laila and Mariam maintain hope by clinging to the love they have for one another, finding in each other the strength to carry on. The bond which Laila and Marian share gives real beauty to Hosseini’s work. Although the premise of the story itself is tragic, the love, care and compassion that exists in spite of all this is incredibly heart-warming. They are dependent, both physically, and emotionally, on one another, and they survive, in spite of everything by putting their faith in their love for one another. Hosseini adds an historical aspect to the novel, without making the history overwhelming. Although there are sections of the text dedicated to the war raging within Afghanistan, it is the way the war affects the lives of the Afghanis that stands out beyond anything else. Hosseini is successful in making the novel historically accurate, without weighing it down like a historical text book. At the same time, although the story itself is fictitious, and Laila and Mariam are not the names of characters that really lived, the plight of women living in Afghanistan is only too real. I find the creation of fictional characters to express real events to be very effective at evoking feeling in the reader. When I read a book I often feel that I connect with the characters on a very personal level, and the empathy I feel towards the character is somehow far greater than that towards real people who I have read about through historical texts. Ultimately, A Thousand Splendid Suns is more than just the story of Mariam and Laila’s friendship. It is the story of Afghanistan, and of the Afghani people. Hosseini is concerned with conveying the effect that living in such as society has had, not just on the women, but on everyone. I shall read this on your recommendation!